Home > Your Inheritance > When Should I Use the Power of Attorney? Power of attorney, more correctly known as lasting power of attorney or LPA, is an important legal facility allowing individuals to appoint others to take charge of financial affairs and other crucial aspects of their day-to-day lives. It should only be used in very specific circumstances, and it is vital that the nominated individual is chosen carefully. Broadly speaking, LPA refers to a legal document appointing someone to take charge of the affairs of another individual. The appointed person is known as the ‘attorney’. Power of attorney can be granted at any time when the individual whose affairs will be taken charge of is mentally capable. This is known as ‘having capacity’. It must then be registered with the Office of the Public Guardian; failure to do so will render the document unenforceable. However, it is important to remember that an LPA document, once registered, can be used at any time – regardless of whether or not you are mentally capable. You should therefore think carefully about timing in order to avoid the possibility of having someone take charge of your affairs when you are still capable of making decisions yourself. There are two types of LPA. A Property and Affairs LPA grants an attorney the power to make financial decisions for you, while a Personal Welfare LPA grants the power to make healthcare and general wellbeing decisions on your behalf. 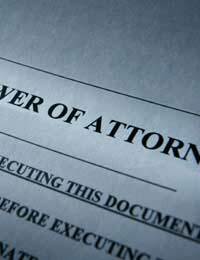 When should I register Lasting Power of Attorney? You should give serious consideration to timing when it comes to drawing up LPA. To begin with, it is important that you draw up the document and nominate an attorney in good time; if you know that you have an illness that will ultimately render you unable to make your own decisions you should probably think about registering an LPA sooner rather than later. However, you should make sure that your nominated attorney will be able to judge when you are no longer capable of making your own decisions; you will presumably wish to avoid the possibility of the attorney taking charge of your affairs before it is absolutely necessary for them to do so. It is therefore generally best to nominate a close family member or friend, although professional attorneys do exist. It is also possible to cancel an LPA. This can be done at any time, as long as the individual whose affairs are to be managed still has capacity. Furthermore, a Property and Affairs LPA will automatically be cancelled if the nominated attorney becomes bankrupt. Drawing up and registering an LPA is a significant life decision, and one that should only be taken after serious consideration. You should think about seeking professional advice before entering into this sort of arrangement. The Office of the Public Guardian can offer general advice regarding LPA, but you should also think about taking personalised advice from a solicitor. Finally, make sure that you are not rushed into granting LPA. No-one can force you to enter into such an arrangement, and you should only do so in your own time.